A couple of summers ago we (along with family help) built a bridge over the little stream in our woods. It has become a focal point of our daily walks. 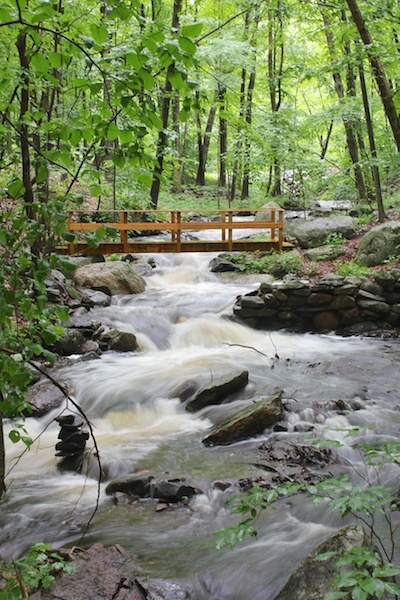 With all the recent rain it is much more than the usual bubbling brook. 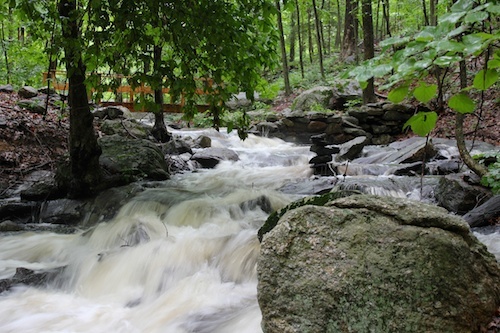 Here are a couple of photos I took as I experimented with a longer shutter speed to blur the water. OH that is so beautiful. I'd want to camp there. So pretty and I can imagine the sound the water makes. I'm so envious. You are very lucky to have this on your property, and such gorgeous property. I'm sure you enjoy it very much. Your bridge is perfect. This little corner of our property was under appreciated because of difficult access until we built the bridge. Now it is on one of the main trails that we hike daily, and share with the neighbors. We love it. Although, to keep it real, it is incredibly buggy! The mosquitoes!!!! !